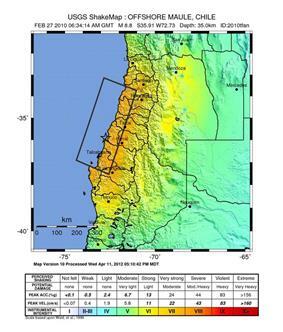 The 2010 Chile earthquake occurred off the coast of central Chile on Saturday, 27 February 2010, at 03:34 local time (06:34 UTC), having a magnitude of 8.8 on the moment magnitude scale, with intense shaking lasting for about three minutes. It ranks as the sixth largest earthquake ever to be recorded by a seismograph. It was felt strongly in six Chilean regions (from Valparaíso in the north to Araucanía in the south), that together make up about 80 percent of the country's population. According to the United States Geological Survey (USGS) the cities experiencing the strongest shaking—VIII (Destructive) on the Mercalli intensity scale (MM)—were Arauco and Coronel. According to Chile's Seismological Service Concepción experienced the strongest shaking at MM IX (Violent). The earthquake was felt in the capital Santiago at MM VII (Very Strong) or MM VIII. Tremors were felt in many Argentine cities, including Buenos Aires, Córdoba, Mendoza and La Rioja. Tremors were felt as far north as the city of Ica in southern Peru (approx. 2400 km). The earthquake triggered a tsunami which devastated several coastal towns in south-central Chile and damaged the port at Talcahuano. Tsunami warnings were issued in 53 countries, and the wave caused minor damage in the San Diego area of California and in the Tōhoku region of Japan, where damage to the fisheries business was estimated at ¥6.26 billion (US$66.7 million). The earthquake also generated a blackout that affected 93 percent of the Chilean population and which went on for several days in some locations. President Michelle Bachelet declared a "state of catastrophe" and sent military troops to take control of the most affected areas. According to official sources, 525 people lost their lives, 25 people went missing and about 9% of the population in the affected regions lost their homes. According to the USGS the epicenter of the earthquake was about 3 km (1.9 miles) off the coast of Pelluhue commune in the Maule Region. This is about 6 km (3.7 miles) west of the village of Chovellén, 15 km (9.3 miles) southwest of the town of Pelluhue and at a point approximately 100 km (62 miles) away from the following four provincial capitals: Talca (to the north-east), Linares (to the east), Chillán (to the south-east) and Concepción (to the south). Chile's Seismological Service located the quake's epicenter at about 34 km (21 miles) off the coast of Ñuble Province in the Biobío Region. This is 60 km (37 miles) north of Concepción and 170 km (110 miles) south-west of Talca. The earthquake took place along the boundary between the Nazca and South American tectonic plates, at a location where they converge at a rate of eighty millimeters (about three inches) a year. This earthquake was characterized by a thrust-faulting focal mechanism, caused by the subduction of the Nazca plate beneath the South American Tectonic Plates. Chile has been at a convergent plate boundary that generates megathrust earthquakes since the Paleozoic era (500 million years ago). In historical times the Chilean coast has suffered many megathrust earthquakes along this plate boundary, including the strongest earthquake ever measured, which is the 1960 Valdivia earthquake. Most recently, the boundary ruptured in 2007 causing the 2007 Antofagasta earthquake in northern Chile. The segment of the fault zone which ruptured in this earthquake was estimated to be over 700 km (430 mi) long with a displacement of almost 10 meters, or 120 years of accumulated plate movement. It lay immediately north of the 1,000 km (620 mi) segment which ruptured in the great earthquake of 1960. Preliminary measurements show that the entire South American Plate moved abruptly westward during the quake. A research collaborative of Ohio State and other institutions have found, using GPS, that the earthquake shifted Santiago 11 inches (28 cm) to the west-southwest and moved Concepción at least 3 metres (10 ft) to the west. The earthquake also shifted other parts of South America from the Falkland Islands to Fortaleza, Brazil. For example, it moved Argentina's capital of Buenos Aires about one inch (2.5 cm) to the west. Several cities south of Cobquecura were also raised, by up to 3 meters. The maximum recorded peak ground acceleration was at Concepcion, with a value of 0.65 g (6.38 m/s2). This was the strongest earthquake affecting Chile since the magnitude 9.5 1960 Valdivia earthquake (the most energetic earthquake ever measured in the world), and it was the strongest earthquake worldwide since the 2004 Indian Ocean earthquake and until the 2011 Tōhoku earthquake. It is tied with the 1906 Ecuador-Colombia and 1833 Sumatra earthquakes as the sixth strongest earthquake ever measured, approximately 500 times more powerful than the 7.0 Mw earthquake in Haiti in January 2010. An aftershock of 6.2 was recorded 20 minutes after the initial quake. Two more aftershocks of magnitudes 5.4 and 5.6 followed within an hour of the initial quake. The USGS said that "a large vigorous aftershock sequence can be expected from this earthquake". By 6 March UTC, more than 130 aftershocks had been registered, including thirteen above magnitude 6.0. Shortly after the mainshock seismologists installed a dense network of seismometer along the whole rupture area. This network captured 20.000 aftershocks in the 6 months after the mainshock and shows a detailed picture of the structure of the Chilean margin. Seismicity is focused in the depth range 25–35 km and in an deeper band of between 45 and 50 km depth. Around 10.000 aftershocks occurred in the region of two large aftershocks in the Pichilemu region. A 6.9-magnitude offshore earthquake struck approximately 300 kilometers southwest of, and less than 90 minutes after, the initial shock; however, it is not clear if that quake is related to the main shock. A separate earthquake of magnitude 6.3 occurred in Salta, Argentina, at 15:45 UTC on 27 February, at a depth of 38.2 km (23.7 mi); two people were injured and one died in Salta. This earthquake was followed on 1 March, at 06:32 UTC by a magnitude 4.9 aftershock. Four other earthquakes above M5.0, some possible aftershocks, also occurred near the border in Argentina following the Chile earthquake; a magnitude 5.0 earthquake occurred in Mendoza on 28 February, a M5.3 earthquake in Neuquen and a M5.2 in San Juan on 2 March, and a M5.1 quake in Mendoza on 4 March. Another strong earthquake occurred on 4 March, at 22:39 UTC in Antofagasta in northern Chile, with a magnitude of 6.3. Minor quakes generated by the main one could be felt as far away as São Paulo, Brazil, located about 3,000 km (1,900 mi) away from Concepción. Since the major earthquake, and as of 15 March, at least four to forty >M5.0 earthquakes have been recorded daily in the vicinity of the main earthquake, including four above magnitude 6.0 between 3 and 0 March:00 UTC 6 March. On 5 March, two aftershocks above M6.0 were reported. The first was a 6.3-magnitude off the coast of the Biobío Region. The second was near the epicenter of the original quake at 08:47 local time with a magnitude of 6.6. On 11 March, the March 2010 Chile earthquake (strength 6.9, treated by some as an aftershock of the February 2010 earthquake) was reported, followed quickly by further aftershocks measuring 6.7 and 6.0. The epicenter of the 6.9 quake was in Pichilemu, O'Higgins Region. On 15 March, two aftershocks of the February 2010 earthquake were reported, one at magnitude 6.1 at 08:08:28 local time offshore Maule, and another at magnitude 6.7 with the epicenter located offshore the Biobío Region, near Cobquecura, at 23:21:58 local time. This tremor was followed by two minor aftershock, one occurring 45 minutes later, measuring M5.5. No tsunami was reported and there were no tsunami warnings issued. On 17 March, at 14:38:37 local time, an earthquake of magnitude 5.2 was recorded in Aisén, in Southern Chile. Another magnitude 5.2 earthquake was recorded in Los Lagos the next day. On 26 March, at 10:52:06 local time, a magnitude 6.2 earthquake hit the Atacama region, in Northern Chile. The Biobio Region of Chile has had strong aftershocks of this earthquake. The first one was a magnitude 6.7 MW earthquake that struck off the coast of Biobío, Chile, at 23:21 on 15 March 2010 at the epicenter, at a depth of 18 kilometres (11 mi). The second earthquake struck on land in the region at 22:58 (UTC) on 2 April 2010 at 5.9 MW and at a depth of 39 km. The third struck on 10:03 (UTC) on 23 April 2010 at 6.2 MW. The Pacific Tsunami Warning Center said that historical data indicates that this quake will not generate a tsunami but still advised of the possibility. On 3 May, at 19:09 an earthquake magnitude 6.4 MW struck off Biobío, Chile, at the epicenter, at a depth of 20 kilometres (12 mi). The epicenter was 55 kilometres (34 mi) south of Lebu. On 14 July 2010, another 6.5 magnitude earthquake occurred in the area. On 2 January at 17:20:18 local time, a 7.1 magnitude aftershock occurred 70 kilometers northwest of Temuco, Chile. On Lautaro, Cañete, Nueva Imperial, Traiguén and Carahue the quake was felt at intensity VI (strong) of the Mercalli scale. In Temuco it was perceived at intensity V (moderate). In Talcahuano, Concepción, Chillán, Osorno and Valdivia it shook at intensity IV (light). According to the USGS the earthquake's epicenter was located on the ground, east of the coastal town of Tirúa in the Araucanía Region. However, according the University of Chile's Seismological Service, the seismic event was located 134 kilometers off the coast of Tirúa, measuring a magnitude 6.9 ML. The University of Chile also reported that the localities who received the strongest shaking (VI) were Curanilahue, Lebu and Tirúa. In Concepción, Talcahuano and Temuco it was felt at intensity V, and in Chillán and Valdivia at intensity IV. A magnitude 6.2 Mw aftershock struck the coast of Biobío, Chile at a shallow depth of 15.1 km (9.4 mi) on 1 June 2011 at 08:55 local time (12:55 UTC). It was centered just offshore Arauco Province near a moderately populated area, with most structures in its vicinity reported to be resistant to earthquake shaking. Strong shaking registering at VI on the Mercalli scale was felt in Lebu, just 7 km (4 ) south of the epicenter, lasting for approximately one minute. Some residents in coastal areas panicked and evacuated their homes. The earthquake was followed by a moderate magnitude 5.1 Mw tremor that occurred about 52 minutes later to the northeast of the main shock epicenter at an estimated depth of 26.9 km (16.7 mi). Initial estimates from the USGS placed its intensity at a magnitude of 6.4 Mw. Seismologists estimate that the earthquake was so powerful that it may have shortened the length of the day by 1.26 microseconds and moved the Earth's figure axis by 8 cm or 2.7 milliarcseconds. Precise GPS measurement indicated the telluric movement moved the entire city of Concepción 3.04 meters (10 ft) to the west. The capital Santiago experienced a displacement of almost 24 centimeters (10 in) west, and even Buenos Aires, about 1,350 kilometres (840 mi) from Concepción, shifted 4 centimeters (1.5 in). It is estimated that Chile's territory could have expanded 1.2 km² as a result. The earthquake also caused seiches to occur in Lake Pontchartrain to the north of New Orleans, United States, located nearly 7,500 kilometres (4,700 mi) from the epicenter of the quake. People were found dead after the earthquake struck, mostly under buildings and inside cars. Many people were also seriously injured. Most injuries were reported in Santiago and Maule. According to an Associated Press Television News cameraman, some buildings collapsed in Santiago and there were power outages in parts of the city. A fire was reported in a chemical plant on the outskirts of Santiago and caused the evacuation of the neighborhood. Santiago's International Airport seemed to have been damaged and the airport authority closed off all flight operations for 24 hours from around 12:00 UTC. On Sunday, 28 February, Ricardo Ortega, head of the Chilean Air Force, said commercial airline services had been partially re-established and aircraft were being allowed to land in Santiago. Santiago's national Fine Arts Museum was badly damaged and did not reopen until 9 March 2010. An apartment building's two-story parking lot collapsed, wrecking 68 cars. According to one health official, three hospitals in Santiago collapsed, and a dozen more south of the capital also suffered significant damage. 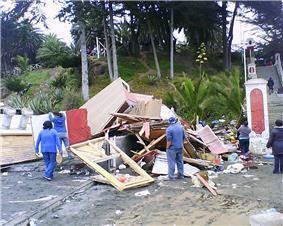 House uprooted to the streets of Pelluhue after the tsunami. Tsunami in Talcahuano, Biobío Region. In Valparaíso, a tsunami wave of 1.29 m was reported. The port of Valparaíso was ordered to be closed due to the damage caused by the earthquake. The port started to resume limited operations on 28 February. 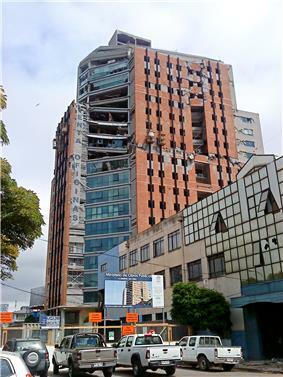 In Viña del Mar, a touristic city and part of Greater Valparaíso, several buildings were structurally damaged, principally in the district Plan de Viña. Many cities in Maule region were seriously affected by the earthquake. Curanipe, only 8 km (5 mi) from the epicenter, was hit by a tsunami after the earthquake and still remained isolated from outside as of 28 February. A surfer said the tsunami "...was like the one in Thailand, a sudden rise of water. One could not estimate the dimension of the wave, because it was advancing foam. There were 10 to 15 rises, the last one being at 08:30 in the morning." In Talca, the capital of Maule region, many dead were trapped in the rubble. The administrative building was uninhabitable, and the authorities had to be set up in the parade ground. All but two of the local hospital's thirteen wings were in ruins. Dr. Claudio Martínez was quoted as saying, "We're only keeping the people in danger of dying." Hospital staff attempted to transport some patients to Santiago on Sunday morning, but roads were blocked. Damaged buildings and fires were reported in Concepción. Rescue teams had difficulty accessing Concepción because of the damaged infrastructure. The fifteen-story residential building "Alto Río" fell backwards, horizontally lay on the ground, and trapped many of the residents. As the building was newly completed, 19 of the apartments were occupied and 36 were unknown if there were residents therein. A 2.34 m (7.68 ft) tsunami wave hit Talcahuano, a port city and part of the Concepción conurbation. The tsunami caused serious damage to port facilities and lifted boats out of the water. In the fishing town of Dichato, which has 7,000 residents, it was the third tsunami wave that ended up being the most damaging. Dilapidated buildings could be seen on the streets of Temuco, about 400 km (250 mi) from the epicenter. The adobe of some buildings fell. Façades fell in pieces and crushed cars. Two people were reported dead because of not having been able to escape from a nightclub. On 27 February, it was reported that "to find an open business is almost impossible" ("Encontrar un negocio abierto es casi imposible"). In Chile, 370,000 homes were damaged. The final death toll of 525 victims and 25 people missing was announced by authorities in January 2011. This is down from early reports on 3 March of 802 people dead. On 10 March, Swiss Reinsurance Co. estimated that the Chilean quake would cost the insurance industry between 4 and 7 billion dollars. And this is the same estimate made by the rival German-based Munich Re AG. Fire at a plastics plant, Santiago, Chile. Hernán Henríquez Hospital of Temuco had to be evacuated after the earthquake. A car crushed by the rubble of a collapsed building in Temuco. Notes: USGS=United States Geological Survey, SS=Chile's Seismological Service. The table below shows the percentage of the regional population whose homes were destroyed or were severely damaged by the earthquake and tsunami in the six most affected regions. The data were collected between May and June of 2010. Source: Casen Post-Earthquake Survey, Ministry of Planning. Despite President European Union, responded to the earthquake and sent messages of condolence to the government and people of Chile over the loss of lives and property. Argentina, Mexico, the United States, United Kingdom, People's Republic of China, Singapore, Haiti, and Pakistan were among the countries that responded earliest following the quake. Appeals for humanitarian aid were issued by the UK-based Oxfam, Save the Children and others. The Chilean NGO Un Techo para Chile constructed 23,886 transitional houses for families affected by the earthquake. Nearly half the places in the country were declared "catastrophe zones", and curfews were imposed in some areas of looting and public disorder. On 28 February 2010, a day after the earthquake, some affected cities were chaotic, with extensive looting of supermarkets in Concepción. Items stolen included not only food and other necessities, but also electronic goods and other durable merchandise. To control vandalism, a special force of carabineros (police) was sent to disperse rioters with tear gas and water cannons. However, measures were taken late. The outgoing president didn't want to remind people of the Dictatorship years by militarizing the streets, thus failed to provide assistance on time to the city. When the situation became unsustainable and all sectors of the population were demanding actions, the government authorized the use of the military to control the affected cities. Despite these and other government acts (including the curfews), pillaging continued in both urban and rural areas of the affected zones. Reportedly, military police arrested 160 in Concepción on 1 and 2 March. In Concepción, despite the militarization of the zone, mobs continued to steal from supermarkets and went as far as to set one store ablaze. The government warned looters they would face the full weight of the law, as penalties for stealing are increased under a state of catastrophe. A week after the quake the police —tipped by neighbors— arrested three people with massive quantities of looted goods stashed in their homes. Other looted goods such as mattresses, furniture, television sets and other electronic appliances were abandoned in the streets of Concepción during the following days. According to the BBC on 5 March, the city and fishing port of Talcahuano, which lies but a few kilometers down the coast from Concepción, has been left largely to fend for itself. Neighbourhood vigilante groups, including one led by a public works employee with a gun license, and the few police present allow such behavior as residents' siphoning fuel from tanks at a petrol station, but step in if someone starts to attack a cash machine. One man stated, "I've personally saved dozens of people from attack in this apartment block." By 1 March, prison guards in a prison in Chillán had recaptured 36 of 203 prisoners who had escaped following the earthquake. During their escape, prisoners burned seven houses close to the prison. A witness in Chillán asserted that he had been robbed by prisoners with a machine gun who had also forced his girlfriend to kiss them. Another witness alleged sexual molestation by around twenty men who were believed to be escaped prisoners. The leading Chilean newspaper El Mercurio described the situation in Chillán as reminiscent of the "Wild West". Four hours after the earthquake, when the death count was still low, President Bachelet gave a press conference in which she informed the population of the situation and stated that Chile did not yet need international aid. However, about two million people were affected by the quake with more than 500,000 houses uninhabitable. In many cities, people slept in tents, in parks or simply on the streets for fear of aftershocks. The government began distributing food and other vital aid around the country. On 28 February, President Bachelet said that her government had reached an agreement with the major supermarkets which would allow them to give away basic foodstuffs in stock to people affected by the earthquake. By 28 February, the Santiago Metro rapid-transit network was already partially up and running and expected to be fully operative on the following day, 1 March. On 4 March, President-elect Sebastián Piñera, who assumed office on 11 March, was quoted as saying that his goals were "to cope with the emergency needs of citizens, find people who are still missing, provide prompt and timely assistance to the sick and wounded, and restore law and order so that people can return to peace." Authorities of the central port city of San Antonio speaking on 3 March 2010, stated that the port had returned to eighty percent of capacity. On the same date, Raul Maturana, a spokesman for the Federation of Port Workers' union, stated that the port of Valparaíso was operating normally. However, ports in southern Chile, which were closer to the epicenter, remained closed. On 4 March, President Bachelet said that Chile would need international loans and three to four years to rebuild. On 10 March the National Commission for Agricultural emergencies (CNEA) assured that milk and wheat prices would not rise, despite fears of lack of fuel supply for transport and harvest of these products. In the same CNEA report the mill associations of central and southern Chile are said to have expressed that they had currently no production difficulties. Despite of this in 11 March newspaper La Segunda cited the president of the bakeries association complaining on unjustified price rises for flour, who said of cases of price rises of 10 to 20%. The earthquake affected production at the Compañía de Cervecerías Unidas (CCU) and Cervecería Chile factories that together have a 90% share of the Chilean beer market. With an average annual per capita consumption of 36 liters, scarcity caused prices to rise from 990–1500 to 2000 Chilean pesos per litre. CCU responded by increasing capacity of their plant in Temuco that did not suffer major damage during the earthquake and by importing beer from their factories in Argentina. 50 trucks with beer are reported to have reached Santiago from Argentina. In March 2010, ten CCU executives said that the country will not run out of beer and that within two to three months production levels would be normalized. Liquor store owners expressed complaints regarding a beer rationing scheme implemented by CCU. The scarcity favoured consumption of "premium beers" like Kunstmann and Paceña. The U.S. National Weather Service's Pacific Tsunami Warning Center issued a tsunami warning throughout a huge swathe of the Pacific region, including Antarctica. In the Americas, the warning extended to Chile (including Easter Island), Colombia, Costa Rica, Ecuador, El Salvador, Guatemala, Mexico, and Panama. A warning was also issued for the Oceania and Pacific Islands nations and territories of American Samoa, Australia, the Cook Islands, the Federated States of Micronesia (including the FSM states of Chuuk, Kosrae, Pohnpei and Yap), Fiji, French Polynesia, Guam, Hawaii, Jarvis Island, Johnston Island, the Kermadec Islands, Kiribati, Marcus Island, the Marshall Islands, Midway Island, New Caledonia, New Zealand, Niue, the Northern Mariana Islands, Palau, Papua New Guinea, Pitcairn Islands, Samoa, the Solomon Islands, Tokelau, Tonga, Tuvalu, Wallis and Futuna and Wake Island. Tsunami warnings were also in effect as far away as East and Southeast Asia including Japan, Indonesia, Hong Kong, the Philippines, Russia and Taiwan. Coastal areas of Canada's westernmost province British Columbia was under a tsunami advisory, and this was the most alarming advisory as the earthquake occurred during the same time as the 2010 Winter Olympics in Vancouver. No large wave was expected to strike British Columbia, but strong local ocean currents combined with a wave put low-lying coastal regions at risk of flooding. The first wave was expected to reach southern British Columbia at 15:11 local time. Residents were advised to avoid beaches, harbours and marinas. A tsunami advisory was also issued for coastal areas of California, Oregon, Washington and southern Alaska in the United States. This tsunami advisory was canceled as of 07:13 UTD on 28 February. The projections use DART (Deep-ocean Assessment and Reporting of Tsunamis) gauges spread along the sea floor, which is a fairly new technology. Initial deep sea readings showed wave height of 25 centimeters, which is huge for deep water, according to Gerard Fryer of the Pacific Tsunami Warning Center. He went on to say, "although it was huge, we didn't quite know what it meant because we haven't much experience with those. As we get more under our belts, we'll get better." Agustín Ross balcony damaged after the earthquake and tsunami in Pichilemu. Some 30 minutes after the first shock, consecutive tsunamis hit coastal towns, among which Constitución suffered the hardest damage; subsequently, a tsunami amplitude of up to 2.6 m (8 ft 6 in) high was recorded in the sea at Valparaíso. A wave amplitude of 2.34 m (7.68 ft) was recorded at Talcahuano in the Biobío Region. Robinson Crusoe Island, the largest of the Juan Fernández Islands, was struck by a large wave led to the deaths of four people on the island, with eleven people reported as missing, according to Provincial Governor Ivan De La Maza. President Bachelet is reported to have sent an aid mission to the remote island. Initially, the New Zealand Ministry of Civil Defence and Emergency Management (CDEM) said they did not expect a tsunami to reach New Zealand, but later issued a warning stating that waves of up to 1 m (3 ft 3 in) high were likely for the eastern and later the entire New Zealand coast. By 19:55 UTC (08:40 local), CDEM reported wave activity of 50 cm (1.6 ft) in the Chatham Islands, and 2 m (6 ft 7 in) surges were reported there later in the morning. A surge 2.2 m (7 ft 3 in) high hit the South Island's Banks Peninsula, while surges up to 1 m (3 ft 3 in) high were reported in the northern North Island. By mid afternoon (local time), Civil Defence had downgraded the tsunami warning to an alert, while still advising that sea levels could change quickly for up to 24 hours from the initial surge. The U.S. Antarctic Program's coastal station along the Antarctic Peninsula, Palmer Station, went on a tsunami alert shortly after the earthquake struck Chile. To prepare for a possible tsunami, station personnel removed all Zodiac boats from the water and moved any materials from low-lying areas that waves could have swept away. Personnel also retreated to the station's highest building, GWR, while the tsunami warning was in effect, Ellis said. Palmer personnel developed a tsunami emergency plan following the 2004 earthquake in the Indian Ocean that created a tsunami that killed more than 230,000 people in 14 countries. 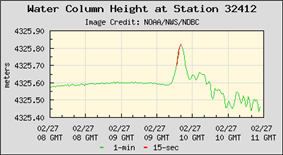 While no noticeable tsunami occurred at Palmer, the station tide monitor displayed bumps of several centimeters, signifying that a small wave had indeed reached the shores of Anvers Island. The  As a result of the warnings, patrolled beaches in New South Wales and Queensland remained closed (red flags) and lifeguards ushered people to leave the water. However beach goers and surfers ignored the warnings. Numerous onlookers also crowded parts of the shore to view potential effects of the tsunami. The beach ban was lifted by the end of the day and there was no reports of damage, flooding or other emergencies. Tsunami waves of between 10 cm and 50 cm were recorded and their surges were believed to have created strong currents. Increases in sea levels include: Norfolk Island 50 cm, Gold Coast (Qld) 20 cm, Port Kembla (NSW) 14 cm, Southport (Tas) 17 cm. A wave measuring up to 1.8 m (5 ft 11 in) high struck portions of French Polynesia between 15:50 to 17:50 UTC with no reports of injuries as of February 28, 2010. A wave 4 meters high is reported to have struck Hiva Oa in the Marquesas Islands. The first waves were expected to hit the main island of Tahiti at approximately 16:50 UTC (07:50 local). Cars and other automobiles were banned from roads closer than 500 m (1,600 ft) from the Pacific Ocean. The Philippine Institute of Volcanology and Seismology (Phivolcs) issued an advisory that tsunami wave(s) were expected to hit the eastern coast of the Philippines on Sunday between 05:00 and 06:30 UTC (13:00 and 14:30 local). Residents of 19 eastern provinces "are advised to prepare for possible evacuation." However, at 15:15 on 28 February 2010, all warnings have been cancelled. United States Senators Daniel Inouye and Daniel Akaka issued a joint press release announcing the first tsunami evacuation in Hawaii since 1994. Warning sirens were sounded throughout the state, as hotels in Waikiki evacuated tourists at 6 a.m. People in tall buildings were encouraged to move above the third floor. Waves measuring nine 2.7 metres high were originally predicted to strike Hilo Bay on the Big Island of Hawai'i at 11:05 local time (21:05 GMT), but by 11:18, major receding and waves had not been reported on the shoreline. By 11:40, several waves hit the islands amounting to raising and lowering of the sea near the coast, and a fourth wave hit around 13:12. The tsunami warning for Hawaii was canceled in the early afternoon on Saturday, 27 February. Gerard Fryer, a geophysicist for the Pacific Tsunami Warning Center was quoted as saying: “We expected the waves to be bigger in Hawaii, maybe about 50 percent bigger than they actually were." Early in the morning, the Center expected waves of 3 metres. In actuality, the highest tsunami waves ended up being about 1.5 to 1.8 metres peak to trough. Small waves were expected in Southern California, and receding was reported at Long Beach. Minor damage was reported on some coastal areas. The tsunami damaged navigation buoys at Ventura. Additionally, a boat was torn loose from its mooring and minor erosion occurred within Ventura Harbor. Damage to docks and pilings in the area was moderate. Argentina has sent construction teams to Chiloé Island to help reconstruct some of the washed away coastal buildings. In July 2010, the government of Argentina released a statement that they would lend $300 million to Chile for reconstruction efforts using Argentine goods. The following data, published by the Pacific Tsunami Warning Center and the National Tsunami Warning Center, lists measured and reported values of the tsunami when it arrived at specific places. Some data is taken from the Chilean Army. ^ The numbers were given by Chilean National Emergency Office (ONEMI) until 3. March. Up 14. March the Ministry of the Interior. ^ a b c d e f "USGS Earthquake Details". ^ a b c "PAGER–M 8.8–OFFSHORE MAULE, CHILE". Earthquake.usgs.gov. Retrieved 27 February 2010. ^ a b "Reuters earthquake report". ^ "Science Highlights 2010 – UNAVCO Event Response – Mw=8.8 Chile Earthquake Feb. 27, 2010". UNAVCO. Retrieved 23 March 2011. ^ "Confirman que el sismo de Chile se sintió en Buenos Aires" (in Spanish). Infobae. 27 February 2010. Retrieved 27 February 2010. ^ "En la región de Cuyo "se sintió muy fuerte" el temblor de Chile". Infobae.com. 27 February 2010. Retrieved 27 February 2010. ^ "Temblor sacude Ica y causa temor en pobladores tras terremoto en Chile". ^ "Tsunami After Major Earthquake Hits Chile". ^ "Magnitude 8.8 – OFFSHORE BIO-BIO, CHILE". Earthquake.usgs.gov. Archived from the original on 16 March 2011. Retrieved 11 March 2011. ^ Fisheries took ¥6 billion hit from Chile tsunami, Japan Times'. 28 March 2010. ^ "Apagón en el SIC del 27 de Febrero de 2010". Cdec-sic.cl. Retrieved 11 March 2011. ^ Casen Post-Earthquake Survey, Ministry of Planning. ^ a b Swiss Re puts Chile quake insurance cost at $4-7BN, Associated Press, 10 March 2010. ^ "Chile Earthquake | Magnitude 8.8". British Geological Survey. 27 February 2010. Retrieved 11 March 2011. ^ Fountain, Henry (27 February 2010). "Underwater Plate Cuts 400-Mile Gash". The New York Times. Archived from the original on 3 March 2010. Retrieved 27 February 2010. ^ "Researchers show how far South American cities moved in quake, Research News, Ohio State University, March 8, 2010". Researchnews.osu.edu. Retrieved 23 March 2011. ^ "Chile earthquake moved city of Concepcion 10ft to the west". The Daily Telegraph (London). 9 March 2010. Retrieved 11 April 2011. ^ van der Horst, Loretta (21 April 2010). "Satellite Images Show That Talcahuano "Grew" 1.5 Meters Higher As A Result of Earthquake". Santiago Times. Retrieved 1 May 2010. ^ Araneda, J.C.; Rudnick, H; Mocarquer, S; Miquel, P (October 2010). "Lessons from the 2010 Chilean earthquake and its impact on electricity supply". 2010 International Conference on Power System Technology. Retrieved 9 March 2011. ^ "Historic World Earthquakes". Earthquake.usgs.gov. ^ "Chile-Haiti Earthquake Comparison: Chile Was More Prepared". TheHuffingtonPost.com. 2 May 2011. Retrieved 2 May 2011. ^ USGS, Earthquake Hazards Program (6 March 2010). "10-degree Map Centered at 35°S,75°W". United States Geological Survey. Retrieved 6 March 2010. ^ Lange, D.; Tilmann, F.; Barrientos, S. E.; Contreras-Reyes, E.; Methe, P.; Moreno, M.; Heit, B.; Agurto,, H.; Bernard,, P.; Vilotte, J.-P.; Beck, S. (January 2012). "Aftershock Seismicity of the 27 February 2010 Mw 8.8 Maule Earthquake Rupture Zone,". Earth and Planetary Science Letters. 317-183: 17. ^ USGS, Earthquake Hazards Program (27 February 2010). "Magnitude 6.9 – Off the coast of Bio-Bio, Chile". United States Geological Survey. Archived from the original on 2010-03-02. Retrieved 27 February 2010. ^ USGS, Earthquake Hazards Program (27 February 2010). "Magnitude 6.3–SALTA, Argentina". United States Geological Survey. Archived from the original on 2010-03-02. Retrieved 27 February 2010. ^ "Chile's earthquake death toll rises to 214". News.xinhuanet.com. Retrieved 1 March 2010. ^ USGS, Earthquake Hazards Program (1 March 2010). "Magnitude 4.9–SALTA, Argentina". United States Geological Survey. Archived from the original on 2010-03-04. Retrieved 6 March 2010. ^ USGS, Earthquake Hazards Program (28 February 2010). "Magnitude 5.0–MENDOZA, Argentina". United States Geological Survey. Archived from the original on 2010-03-03. Retrieved 6 March 2010. ^ USGS, Earthquake Hazards Program (2 March 2010). "Magnitude 5.3–NEQUEN, Argentina". United States Geological Survey. Archived from the original on 2010-03-07. Retrieved 6 March 2010. ^ USGS, Earthquake Hazards Program (2 March 2010). "Magnitude 5.2–SAN JUAN, Argentina". United States Geological Survey. Archived from the original on 2010-03-05. Retrieved 6 March 2010. ^ USGS, Earthquake Hazards Program (4 March 2010). "Magnitude 5.1–MENDOZA, Argentina". United States Geological Survey. Archived from the original on 2010-03-07. Retrieved 6 March 2010. ^ USGS, Earthquake Hazards Program (4 March 2010). "Magnitude 6.3 – ANTOFAGASTA, Chile". United States Geological Survey. Archived from the original on 2010-03-08. Retrieved 6 March 2010. ^ "Estado de SP sente reflexo do terremoto de 8,8 graus registrado no Chile" (in Portuguese). ^ "Latest Earthquakes in the World – Past 7 days". Retrieved 5 March 2010. ^ "Strong aftershocks rattle Chile". CNN.com. 28 February 2010. Archived from the original on 7 March 2010. Retrieved 5 March 2010. ^ Forero, Juan (12 March 2010). "Aftershocks a reality check for Chilean President Sebastián Piñera". The Washington Post. Retrieved 11 April 2011. ^ Magnitude 6.9 LIBERTADOR O HIGGINS, CHILE, U.S. Geological Survey, Thurs., 11 March 2010, 11:39:44 at epicenter. This 6.9 aftershock/new earthquake (depending on how one looks at it) had an epicenter at 34.259 S, 71.929 W.
^ Magnitude 6.7 BÍO-BÍO, CHILE, U.S. Geological Survey, Tuesday, Monday, 15 March 2010 at 23:21:59 at epicenter (36.124S 73.147W, 18.0 kilometers depth). ^ "Magnitude 5.2 – AISEN, CHILE". Archived from the original on 2010-03-22. ^ Earthquakes, USGS (26 March 2010). "Magnitude 6.2 – ATACAMA, CHILE". Earthquake Hazards Program. United States Geological Survey. Archived from the original on 29 March 2010. Retrieved 26 March 2010. ^ "Magnitude 6.7 – OFFSHORE BIO-BIO, CHILE". USGS. 26 March 2010. Archived from the original on 22 March 2010. Retrieved 27 March 2010. ^ "Aftershock hits off coast of Chile, no damage". Reuters. 15 March 2010. Archived from the original on 23 March 2010. Retrieved 27 March 2010. ^ "Magnitude 6.4 – OFFSHORE BIO-BIO, CHILE". USGS. 3 May 2010. Archived from the original on 6 May 2010. Retrieved 3 May 2010. ^ "Magnitude 7.1 – ARAUCANIA, CHILE". Earthquake.usgs.gov. Archived from the original on 16 March 2011. Retrieved 11 March 2011. ^ "PAGER – M 7.1 – ARAUCANIA, CHILE". Earthquake.usgs.gov. Retrieved 11 March 2011. ^ "Informe de Sismo". Sismologia.cl. Retrieved 11 March 2011. ^ a b "Magnitude 6.2 – Offshore Bio-Bio, Chile". ^ "PAGER – Magnitude 6.2 – Offshore Bio-Bio, Chile". ^ "Sismo 6,4 Richter afectó a 4 regiones de Chile: Desde el Maule a Los Ríos". ^ "Magnitude 5.1 – Bio-Bio, Chile". ^ "NASA – Chilean Quake May Have Shortened Earth Days". Nasa.gov. 1 March 2010. Retrieved 11 March 2011. ^ "Earth days could be shorter after Chilean earthquake". News.com.au. 22 July 2009. Archived from the original on 3 March 2010. Retrieved 2 March 2010. ^ "Cities located close to Buenos Aires". timeanddate.com. Archived from the original on 31 January 2010. Retrieved 13 March 2010. ^ Mason, Betsy (8 March 2010). "Chile earthquake moved entire city 10 feet to the west". Dailycaller.com. Retrieved 23 March 2011. ^ Researchers Show How Far South American Cities Moved In Quake. Retrieved 9 March 2010. ^ Chile ¨Grows” 1.2 Square Kilometers As A Result Of 27 February Earthquake, The Santiago Times, 12 May 2010. ^ Erdman, Jonathan (27 February 2010). "How strong & rare was quake?". The Weather Channel. Archived from the original on 5 April 2010. Retrieved 27 February 2010. ^ Franklin, Jonathan; Gabbatt, Adam (1 March 2010). "Chilean military takes control of quake-hit cities". The Guardian (London). Retrieved 11 April 2011. ^ "Información al visitante" (in Spanish). Archived from the original on 9 February 2010. Retrieved 10 March 2010. Museo Nacional de Bellas Artes agradece las expresiones de apoyo y comprensión luego del terremoto que afectó su funcionamiento durante la semana pasada. Nos complace informar que reabriremos nuestras puertas el martes 9 de marzo en horario habitual. ^ "Massive quake hits Chile, triggers tsunami". ^ "Esperan entrega de estudios estructurales de departamentos dañados en Viña", El Observador (in Español), 4 March 2010, retrieved 11 April 2011 . ^ "index". Lasegunda.com. 29 September 2006. Archived from the original on 5 April 2010. Retrieved 1 March 2010. ^ "Surfista que sobrevivió en Curanipe: El maremoto se pareció al que hubo en Tailandia". Cooperativa.cl. Retrieved 1 March 2010. ^ "Ansalatina – CHILE: MAS DE 30 MUERTOS EN TALCA". ansa.it. Retrieved 1 March 2010. ^ Lacey, Marc (28 February 2010). "Frantic Rescue Efforts in Chile as Troops Seek to Keep Order". The New York Times. Retrieved 11 April 2011. ^ "Terremoto de 8,8 grados deja unos 214 muertos en Chile". El Universo. 27 February 2001. Archived from the original on 1 March 2010. Retrieved 28 February 2010. ^ "DestrucciĂłn de flamantes condominios en Chile despierta suspicacias". LaRepublica.pe. 23 January 2009. Archived from the original on 4 April 2010. Retrieved 2 March 2010. ^ "Ficha Condominio Alto Río – Departamentos en Concepción". elinmobiliario.cl. Retrieved 2 March 2010. ^ 123.cl – ENTEL. "El sitio de Noticias del 123.cl". NOTICIAS.123.CL. Retrieved 2 March 2010. ^ 'The last wave almost wiped the village off the map', The Irish Times – Tuesday, 2 March 2010. ^ "Sin agua ni luz se mantiene Temuco bajo constantes movimientos telúricos", CronicaLibre.cl (in Español), 27 February 2010, retrieved 11 April 2011 . ^ Carmen De Carlos. "Temuco, a la sombra de la luna – Internacional_Iberoamerica – Internacional". ABC.es. Archived from the original on 7 April 2010. Retrieved 2 March 2010. ^ Rescue efforts continue in Chile, mining industry impacted, Market Watch, 28 Feb 2010, 12:52 p.m. EST. ^ "Ya suman 802 los fallecidos por el terremoto y tsunami". Elmostrador.cl. Retrieved 23 March 2011. ^ "Sismo mayor intensidad (Actualización)". Oficina Nacional de Emergencia. 27 February 2010. Retrieved 2 March 2010. ^ "Situación regional. (Actualiza información)". Oficina Nacional de Emergencia. 28 February 2010. Retrieved 2 March 2010. ^ "Situación terremoto zona centro sur (Actualiza reporte)". Oficina Nacional de Emergencia. 1 March 2010. Retrieved 2 March 2010. ^ "Gestión ONEMI en terreno". Oficina Nacional de Emergencia. 2 March 2010. Retrieved 2 March 2010. ^ "Cursos de acción en atención a zonas afectadas". Oficina Nacional de Emergencia. 3 March 2010. Retrieved 3 March 2010. ^ a b "Turba Terremoto en Chile: Aumenta el número de fallecidos. Bachelet descartó tsunami, y dijo que no necesita ayuda internacional". Impulsobaires.com. 27 February 2010. Archived from the original on 7 April 2010. Retrieved 28 February 2010. ^ "Int'l community offers sympathy, aid to quake-stricken Chile". Xinhua News Agency. 28 February 2010. Retrieved 27 February 2010. ^ President Saddened by Chile Earthquake; Conveys Solidarity to Govt, People of ChileAssociated Press of Pakistan: . Retrieved 27 February 2010. ^ "Centenares de personas saquearon supermercado en Concepción". www.cooperativa.cl. 28 February 2010. Retrieved 28 February 2010. ^ "Turba saquea varios supermercados en Chile tras caos generado por el sismo de 8.8 grados de magnitud". Peru.com. 28 February 2010. Retrieved 28 February 2010. ^ a b "Ya son 723 los muertos por el fuerte terremoto de 8.8 grados que destruyó gran parte de Chile". Peru.com. 1 March 2010. Retrieved 1 March 2010. ^ "Chile troops tackle quake looters". BBC News. 1 March 2010. Retrieved 11 April 2011. ^ "Saqueos y violencia azotan Chile tras terremoto de 8.8 grados". Peru.com. 1 March 2010. Retrieved 1 March 2010. ^ "Chile earthquake: looters return £1.3 million of stolen goods". The Daily Telegraph (London). 8 March 2010. Retrieved 11 April 2011. ^ Will Grant (5 March 2010). "Lawlessness after quake in Chile fishing village". BBC. Archived from the original on 6 March 2010. Retrieved 5 March 2010. ^ "Chile orders curfew amid quake chaos". 28 February 2010. Retrieved 12 May 2013. ^ "Security concerns spread as Chile quake death toll rises". CNN. 28 February 2010. Retrieved 11 April 2011. ^ "Balance: 160 personas fueron detenidas durante la noche". Cooperativa.cl. Retrieved 1 March 2010. ^ "'"Rebuilding Chile 'to take years. BBC News. 4 March 2010. Retrieved 11 April 2011. ^ Chile’s San Antonio Port Returns to 80% Capacity (Update1), Bloomberg, Rodrigo Orihuela(Buenos Aires) and James Attwood, 3 March 2010. ^ Wade, Terry (5 March 2010). "Chile wants loans, focuses on aid for quake areas". Reuters. Retrieved 11 April 2011. ^ Minagri anuncia que consecuencias de terremoto no afectarán abastecimiento de trigo y leche, 10 March 2010. ^ Molineros aseguran normal abastecimiento de harina, pero panaderos acusan alzas en precios, La Segunda, 11 March 2010. ^ Rodrigo Bustamante Santiago de Chile. "El sismo hace escasear la cerveza en Chile". Bbc.co.uk. Retrieved 23 March 2011. ^ "Continúa la escasez de cerveza por terremoto". Mercurioantofagasta.cl. 14 April 2010. Retrieved 23 March 2011. ^ "Australia on tsunami watch after quake". News.ninemsn.com.au. 27 February 2010. Archived from the original on 2 March 2010. Retrieved 27 February 2010. ^ "Massive earthquake, aftershocks rattle Chile tsunami warning issued". ^ « Strong earthquake hits Chile, Tsunami warning issued in region », peoplestar.co.uk, Retrieved on 27 February 2010. ^ "Pacific Tsunami Warning Center". ^ "Tsunami warning in effect for Hawaii". ^ "PTWC Bulletin 18: cancelling warning for all countries except Japan and Russia". Retrieved 1 March 2010. ^ "Tsunami threatens Australia, New Zealand, Hawaii, Pacific Rim". news.com.au. 28 February 2010. Retrieved 11 April 2011. ^ a b c d Memmott, Mark (27 February 2010). Massive' Earthquake Hits Chile; Tsunami Warnings Up Across Pacific"'". ^ a b c "Coastal B.C. under tsunami advisory". ^ "Coastal B.C. under tsunami advisory after massive Chilean earthquake". ^ "Tsunami advisory for Washington Coast". MyNorthwest.com. 27 February 2010. Retrieved 27 February 2010. ^ "Tsunami waves hit Russia, no damage reported". Reuters. 28 February 2010. Retrieved 11 April 2011. ^ Fackler, Martin (28 February 2010). "Officials Breathe Sigh of Relief as Tsunami Passes". The New York Times. Retrieved 11 April 2011. ^ a b Pang, Gordon Y.K. (28 February 2010). "Warning center learns from miscalculation". Honolulu Advertiser. Retrieved 11 April 2011. ^ « Pacific coastline devastated; 350 killed by tsunami that hit one small town »,msnbc.msn.com, Retrieved on 1 March 2010. ^ "Tsunami message from NTWC". Wcatwc.arh.noaa.gov. Archived from the original on 28 March 2010. Retrieved 27 February 2010. ^ a b TSUNAMI BULLETINS–index of frequently updated bulletins issued by the Pacific Tsunami Warning Center, including the latest. ^ Gutierrez, Thelma (27 February 2010). "First waves of tsunami arrive at Hawaii". Honolulu, Hawaii: CNN. Archived from the original on 3 April 2010. Retrieved 27 February 2010. ^ "Partial evacuation of Chile's Easter Island ordered | ABS-CBN News Online Beta". Abs-cbnnews.com. Archived from the original on 7 April 2010. Retrieved 28 February 2010. ^ "Chile minister says navy erred on tsunami". MSNBC. 28 February 2010. Archived from the original on 11 February 2011. Retrieved 11 March 2011. ^ "Chile sacks official over tsunami alert". ^ National Advisory: Tsunami – No Threat to New Zealand, Ministry of Civil Defence & Emergency Management, 20:34 on 27 February 2010. ^ National Warning: Tsunami Threat to New Zealand, Ministry of Civil Defence & Emergency Management, 23:18 on 27 February 2010. ^ a b "NZ on tsunami alert". ^ "#ChileQuake National Warning:Tsunami Threat to NZ Update18". Civildefence.govt.nz. Archived from the original on 4 March 2010. Retrieved 1 March 2010. ^ Edward Gay and Derek Cheng, 1.5-meter tsunami wave hits Chathams, heading for mainland, New Zealand Herald, 28 February 2010. ^ "Lucky low tide keeps Chch safe". 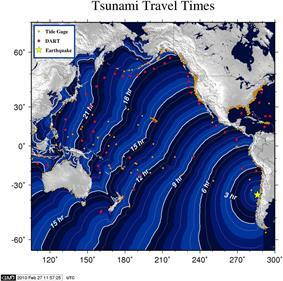 ^ "Tsunami alert downgraded after Chile quake". ^ Tsunami Warning is CurrentJoint Australian Tsunami Warning Centre: . Retrieved 28 February 2010. ^ a b "Tsunami beach ban cancelled in Australia, New Zealand, Hawaii, Pacific Rim". news.com.au. 28 February 2010. Archived from the original on 1 March 2010. Retrieved 28 February 2010. ^ a b "Tsunami waves up to 6 feet hit French Polynesia". ^ "Tsunami hits French Polynesia after Chile earthquake". AFP. 28 February 2010. Retrieved 11 April 2011. ^ a b c d e f "Tsunami alert in Pacific after 8.8 quake in Chile". ^ "Alert Cancellation – Phivolcs". Phivolcs.dost.gov.ph. Retrieved 1 March 2010. ^ "Inouye, Akaka urge calm". ^ "Caldwell serving as acting mayor". ^ Schaefers, Allison (27 February 2010). "9-foot waves forecast for Hilo Bay at 11:05". ^ SONG, JAYMES (28 February 2010). "Tsunami that raced across Pacific delivers glancing blow to islands, Asian coasts". Grand Forks Herald. Associated Press Writer. Retrieved 11 April 2011. ^ "Olympic Games proceed despite tsunami warning". Nationalpost.com. Archived from the original on 1 March 2010. Retrieved 1 March 2010. ^ "Tsunami damages buoys off Ventura, officials say". Santa Clarita Valley Signal. 27 February 2010. Archived from the original on 2 March 2010. Retrieved 27 February 2010. ^ "Ventura County gets a surge from tsunami, but no injuries". Ventura County Star. 27 February 2010. Retrieved 27 February 2010. ^ Cervantes, Juan (28 February 2010). "Guerrero reporta daños mínimos por oleaje". 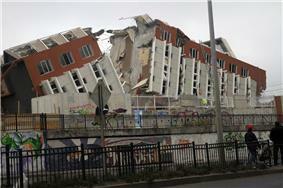 ^ "Argentina To Lend $300M To Chile For Rebuilding-Related Goods". The Wall Street Journal. 22 July 2010. Retrieved 11 April 2011. ^ "National Tsunami Warning Center". NOAA. Archived from the original on 2 April 2010. Retrieved 27 February 2010. ^ 著者来店. "小笠原諸島の南鳥島に津波第一波、１０ｃｍ". Yomiuri.co.jp. Retrieved 1 March 2010. Tsunami Event page for 27 Feb 2010 Chile tsunami – Maximum wave amplitude plot, Propagation animation, Model-data comparison plots. From the NOAA Center for Tsunami Research. Chilean Earthquake Toll Passes 800; Aid Yet to Reach Many Devastated Areas – video report by Democracy Now! 1960 Chile tsunami (earthquake magnitude Mw 9.5) Maximum amplitude plot – for comparison with 27 Feb 2010 Chile tsunami event. From the NOAA Center for Tsunami Research.